*In January 2019, Phoenix acquired Bright Light Systems. The project below references the previous generation of Phoenix’s Highland Series. Atlanta Hartsfield-Jackson International Airport (ATL) is the busiest airport in the world. It has been the world’s busiest airport both in passengers and number of flights by accommodating 100 million passengers (more than 260,000 passengers daily) and 950,119 flights. The airport has 207 domestic and international gates. ATL covers 4,700 acres (1,902 ha) of land and has five parallel runways. 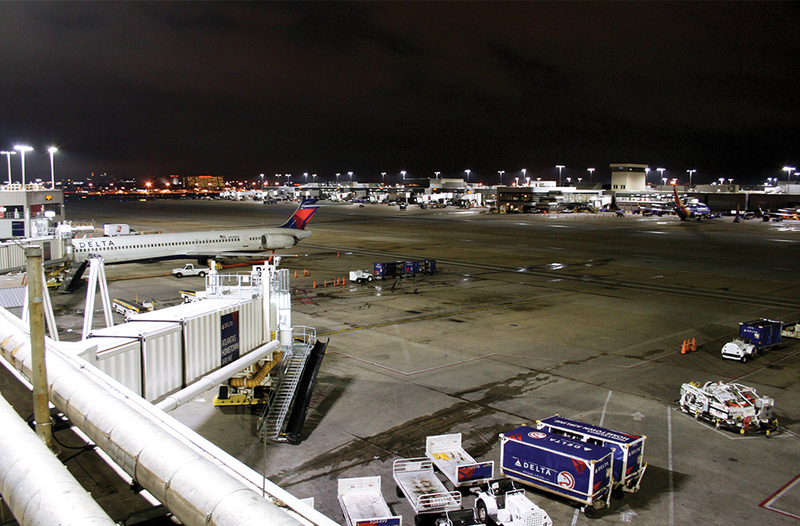 Atlanta airport illuminates their aircraft parking apron with over 740 high pressure sodium lights during night-time operations. 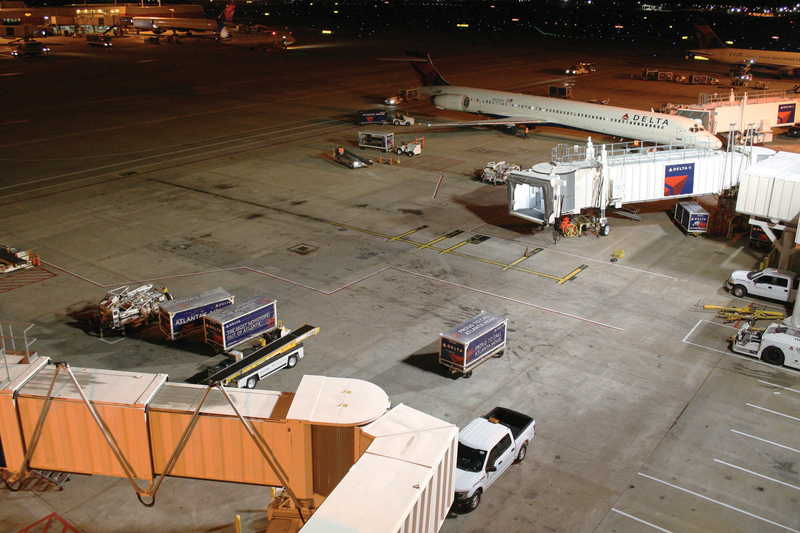 High illuminance levels are necessary to provide adequate safety for ground personnel working through the night. The lighting is controlled via mechanical timers which occasionally fail and leave many lights burning, wasting energy during the day. The HPS lights require constant maintenance with frequent replacement cycles. Retrofit legacy HPS lights with BLS NOVA HM LED High Mast fixtures. 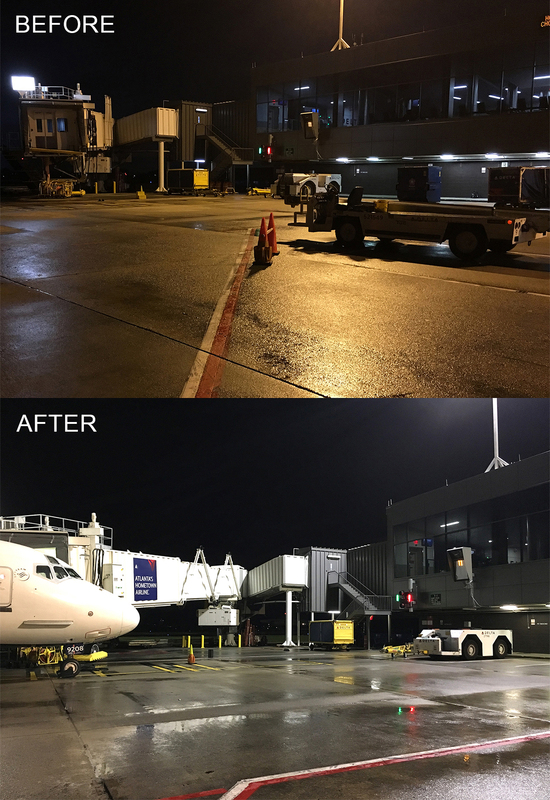 NOVA HM LED fixtures consume only 570 watts and offer flexible optical packages for optimal light coverage on the apron. The crisp, brilliant white light delivers an average illuminance over 4 foot-candles and offers improved color recognition for security cameras and better night-time visibility for ground personnel. Integrated BLMS controls achieves up to 30% in additional energy savings. Adjustable glare shields eliminate light trespass for pilots and ground crews. A 100,000 hour L80 lifetime reduces maintenance costs by $22,910 annually.